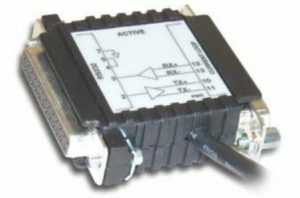 The Single Line Interface Module SLIM is an interface between RS232 and current loop serial communications ports. It comes in three different configurations, as an active, passive, or one loop active, one loop passive device. The “active” device in the current loop provides the current for the loop. There can be only one active device in the current loop. To determine if the device with which you wish to interface is active — measure voltage across the unconnected terminals of the loop. If there is a voltage present while the loop is idle, the unit is an active unit and you need to order a passive SLIM-CL-P. If no voltage is measured across the loop terminals, the device is passive and an active SLIM-CL-A should be ordered. If the device has one loop passive, one loop active, or if it is a TWO WIRE HALFDUPLEX passive device, the SLIM-PC-X unit must be ordered. Specify which loop should be active, which should be passive.